In the second post in my Blockchain Genomics series I ask EncrypGen’s CEO David Koepsell about his company and how it fits into the competitive space. Unlike Luna DNA, they aren’t shying away from crytocurrency, proudly boasting that they have the best token name: $DNA. Read on to hear more about their thoughts on this space. SanDiegOmics (Shawn):Please explain what EncrypGen is doing. What problem are you trying to solve and how are you doing it? 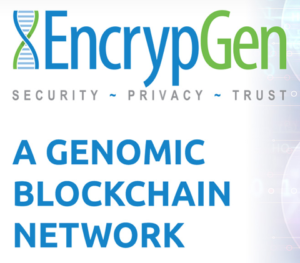 EncrypGen: EncrypGen has been building the world’s first blockchain-based genomic data markets since Dec 2016. The founders are husband and wife Ph.D’s. David is a philosopher and lawyer, and Vanessa is a pharmacogenomicist. Both are concerned with addressing the conflicts between increasing the amount and accessibility of genomic data for science, and increased worries over privacy and security of personal data. Our approach has been agile – we have been investigating different architectural and user-journey paths for solving these concerns, and debuted a prototype as far back as May 2017. We have since settled upon a permission-blockchain architecture and an Ethereum token. Our first product, MyGene-Chain, launched this year and provides a means for individuals to create a profile, start including some phenotypic data, and upload their genetic testing data to our platform. SanDiegOmics: What types of information are accepting from your participants? EncrypGen: We are focused on genomic data, and building the system to accommodate first consumer testing services data. But we will accept over time any type of genetic test. We combine this with user-created profile and phenotype data, to varying levels of granularity, focused on providing a useful and detailed basis for research. We are partnering with other projects that are creating more general, health record blockchains, and will continue to work on integration. Our vision is that this data must be owned and controlled by individuals and used by them for their health and well-being, and should also provide mechanisms for remuneration. SanDiegOmics: Do you anticipate participation to be primarily the initial activity of submitting genomic data, or will you keep participants continually engaged with submitting other forms of data? EncrypGen: Over time, we will continue to roll out additional fields for the phenotypic data, as we get feedback from researchers and adjust to market demands. EncrypGen: All for now, the more and the bigger the better. Indexing it is the tricky part, and at first we will be indexing the popular direct to consumer SNP tests, but we are building for WGS in the long run. SanDiegOmics: If your potential users don’t already have their DNA sequenced, will you be providing that as a service? EncrypGen: Both. We are working on some potential deals that will bring in large numbers of users, especially through employee health plans which are increasingly including genomic testing as part of their benefit packages, and who want to provide their members access to use that data both for their health and to potentially monetize it for science. SanDiegOmics: How exactly will you be using blockchain technology? EncrypGen: The blockchain we have is permissioned, it is used for completing and tracking transactions, and for storing metadata. It also provides a layer of further security and privacy as the only data that ends up on the blockchain is de-identified and encrypted. SanDiegOmics: Can you give an example of the type a meta-data that will be stored in the blockchain? SanDiegOmics: How will participants be rewarded for contributing their data? EncrypGen: The $DNA token is an ERC20 token [based on the Ethereum blockchain] already available on a number of exchanges, exchangeable for fiat and other cryptocurrencies. When users create their profiles and submit their data they will be able to set a price for its use and if a data-consumer finds their profile data interesting they can make a bid for the data and get a structured report without getting the whole file, and the individual is rewarded with the token and protected by not revealing the entire file. [Participants] can hold [the cryptocurrency] all they want, accumulate it, or exchange it on the various exchanges. We hope the DNA economy makes holding $DNA itself attractive and its ability to be used on other platforms, including soon sequencing.com and others, will enhance this attractiveness. SanDiegOmics: Are users given guidance as to what value they set for their data would be generally acceptable? EncrypGen: We will start by setting some suggested prices for data sets based upon the type of test, and then we will let the market decide the proper values. SanDiegOmics: Are you finding that researchers are wanting/willing to buy user data in this piecemeal fashion (I.e., from individually priced genomes)? I would have expected researchers would want to buy access to the entire database or at least large portions of it (e.g., everyone with diabetes, etc). EncrypGen: In our interviews with prospective data buyers we find that if they can retrieve a structured report, and search along the parameters we offer, then they are eager to start to see if they can find significant results from searches at the right cost to enhance current studies, or do entirely new studies. Of course they could do a search for all users with diabetes and then buy reports from all of those users, but narrowing it down by further parameters poses some interesting research options. We also allow them to narrow searches by genes and variants. EncrypGen: There is a huge market out there for data. 23andMe concluded a $400M funding round on the basis of that market as they sell their testing services at a loss. We will tap into and disrupt that market by offering an alternative free market for that data where buyers and sellers can do direct business with one another. SanDiegOmics: This is a really exciting space, so naturally it has attracted a number of competitors. How will EncrypGen stand out from the rest? What do you see being your key advantage? EncrypGen: We have been at this longer than the others, and made more progress technically. We have the first token, with a great name: $DNA, and we have part of our platform operating. Building this sort of system well is hard, and we think our first-mover advantage will help to make our marketplace active and operating profitably sooner than the others. We also recognize the space isn’t zero-sum, and that consumers will have a range of options to choose from. We have thus started the Genomic Blockchain Consortium and invited all the newcomers to it so we can all better serve the public by helping to ensure interoperability and portability of data. SanDiegOmics: What would prevent users from submitting their data to multiple “genome database” companies? Is this a problem? EncrypGen: We are happy to envision a future where customers can put their data on any number of blockchain platforms and see which delivers the most value for them. SanDiegOmics: How much money have you raised and via what mechanisms (ICO-type event, traditional VC, etc)? EncrypGen: We raised $500k in traditional capital seed round, and we have about $3M worth of BTC and DNA tokens at the moment from a token sale event last year.